(Tokyo, 17 June, 2010) The A House is a detached private single family residence situated on the corner of the centrally located, compact and low-rise housing district of Nishiazabu. The volume of the home uses the maximum footprint allowed, though the usable surface of the site is rather small when compared to European standards. bedrooms in the base and at the top, which together sandwich the two more general use levels. A slender threshold along the ground floor protects the dining areas from close contact with the street, and at the same time provides the basement with daylight and natural air. The service and storage zones have been down-sized to allow for generous living spaces. 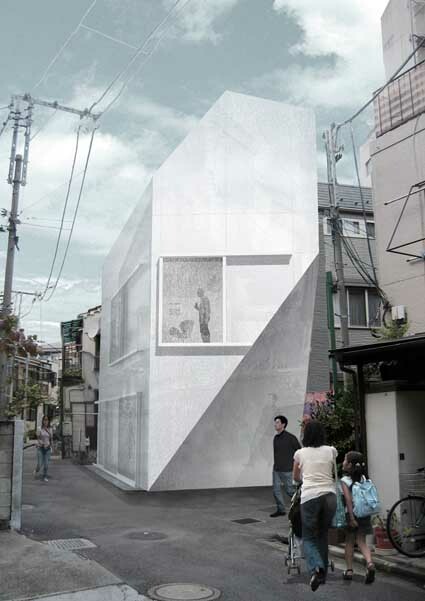 Located in the heart of Tokyo, A-House was designed for a couple with two children, and is sited in a high density, rapidly gentrifying neighbourhood characterised by low-rise residential houses and narrow streets nearby a large park. The house occupies a corner lot with south and west facing facades, and takes full advantage of the minimal local regulations on volume design, allowing for unique and site-specific house to be realised. The concrete structure is wrapped in a façade composed of relief glass with a natural white printed pattern, giving the house a monolithic appearance. The volume, divided into four levels of horizontally divided spaces with floor slabs of varying heights, is connected by a small vertically screwed staircase that, given the small footprint of the building, allows the greatest range of loft like spaces throughout the house. Two bedrooms and a bathroom are situated on the lower level, a kitchen and dining area on the ground floor, living and study on the first floor and a master bed and bath on the top floor with an adjacent outdoor patio on the front end of the house. This patio is strategically situated on the south side to allow for the best natural daylight, while still being protected from the city beyond by the glass façade, which envelopes the outdoor space. The custom pattern printed glass façade allows diffused natural light into the house, while the large openings allow for further control of light filtration. The shutters of glass can be slid back, allowing for maximum daylight and an open view. These sliding elements offer privacy, but also serve as a mediation between the outside and inside, for physical and visual connection. The basement level is offered natural light by windows, at the base of the façade, at ground level, and is composed of the same material as the façade, which gives uniformity to the structure. The crystallised volume extends beyond the neighbouring buildings on the southern portion of the site to allow a view of the nearby park from the top floors, giving the house a connection to green space, while still begin set inside Tokyo’s sea of dense residential housing.